The Night Rating Qualification allows the Private Pilot to fly between “official night” and “official day” (30 minutes after sunset until 30 minutes before sunrise respectively). Nothing compares to the sensation of flying at night, as a unique experience, an amazing panorama, a completely different view by night and improved skill of controlling an aircraft without having a horizon reference. Knowledge – An applicant will complete a course that includes a minimum of 10 hours night rating ground school. Experience – An applicant will complete a minimum of 8 hours of night flight time in aeroplanes. During this stage, the student will review regulations regarding the night rating. In addition, the student will gain a greater understanding of airport lighting systems. During this stage, the student will learn more about human performance and limitations. They will also expand their knowledge of meteorology, weather forecasting and weather interpretation. This stage provides the student with dual training at night. Night navigation skills will be presented. This stage builds upon the skills developed in the first stage. The student will fly solo at night. The hours provided for the Tuition above are the minimum course requirement. 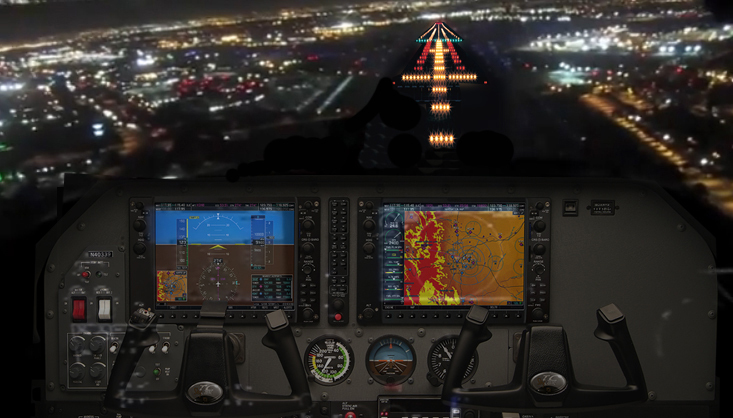 According to the overall performance and progress of the pilot additional instruction may be required to meet the proficiency standards required to satisfactorily complete the Night Rating Program. The number of additional hours will be determined by the Flight Instructor.